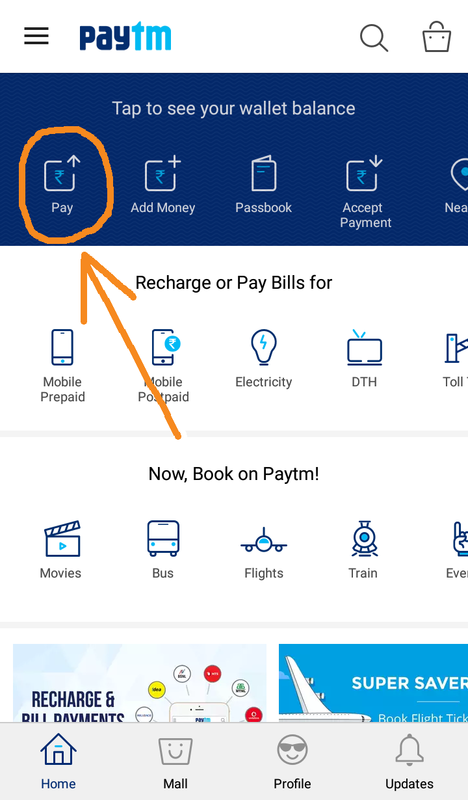 In the Paytm app click Pay as shown before. Then press the top-right dropdown menu (marked by 3 vertical dots) on the next screen. 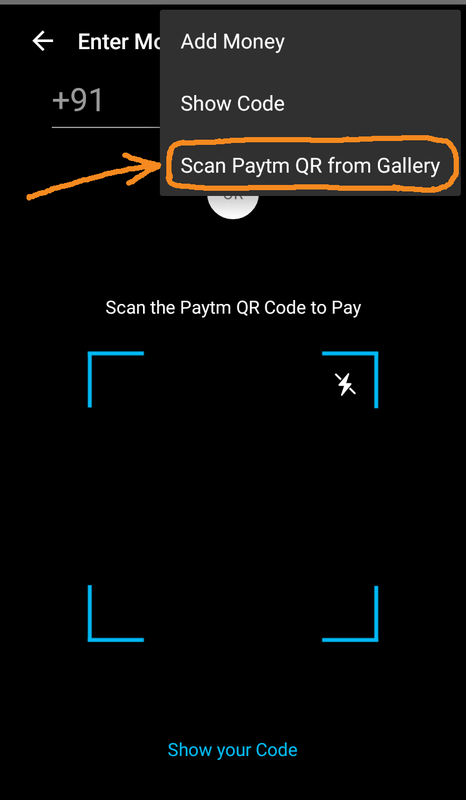 Select "Scan Paytm QR from Gallery". 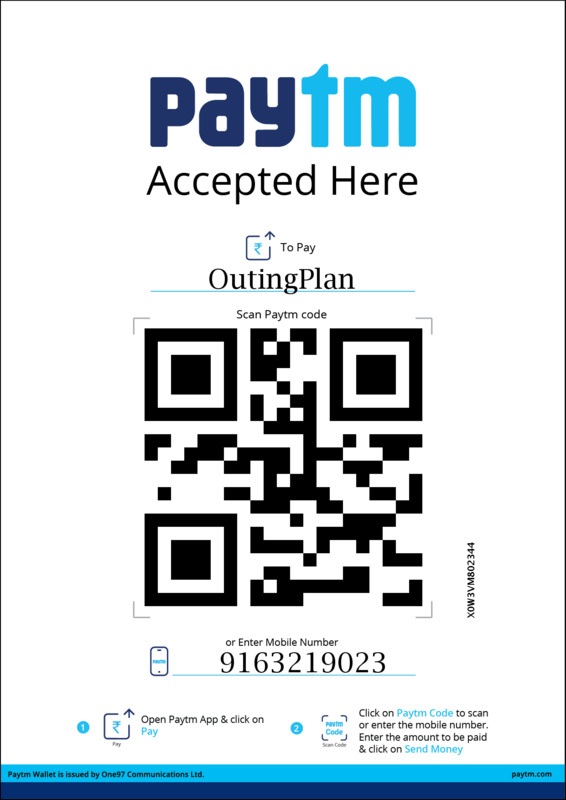 Select the downloaded "OutingPlan Paytm.jpg" file. If the QR code is successfully scanned or loaded the following screen will be displayed. Make sure "OutingPlan 9163219023" is displayed as the Payee before you make any payment. Enter the amount as mentioned in your Booking invoice, and then press Pay. 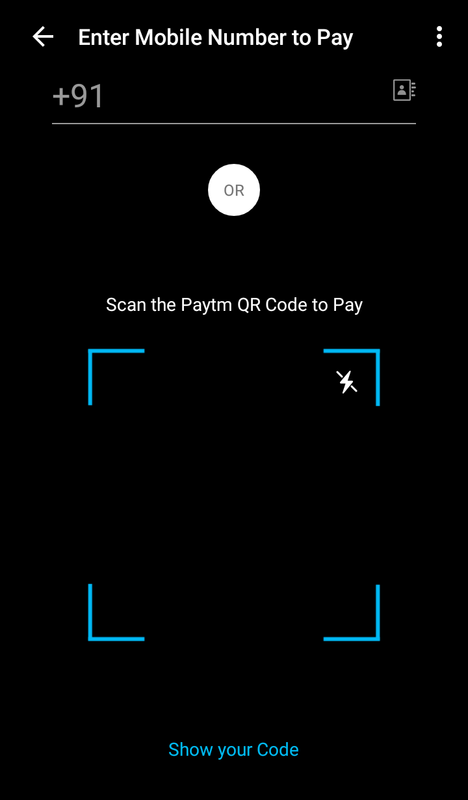 If you already have any amount as your Paytm Wallet balance, you can use that to make payment as well. Upon successful payment a confirmation screen will be displayed on your mobile phone with the Txn ID. All you just need is your mobile number to open a Paytm account !! Please call +91-9163219023 or +91-9748394555 for more details and guidance on Paytm. Use the UPI app of your bank or any third party app to make the payment. 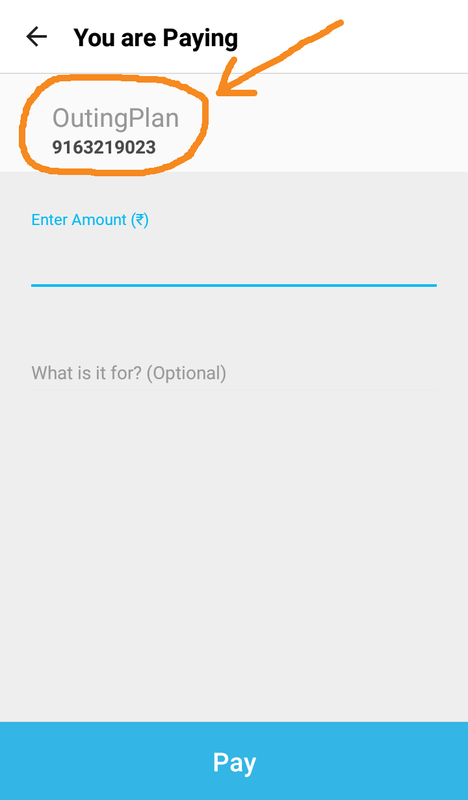 If you are a first time user you have to create a "Virtual Payment Address" (VPA) of your choice which will uniquely identify your bank account. If you are registered with UPI, you can pay by simply entering our VPA as the payee in your UPI app. Enter the amount as mentioned in your Booking invoice, and then press Pay. Alternatively, you can tell us your VPA and we'll send the Booking invoice directly to your account. All you have to do is just accept the invoice through your UPI app !! Click here for the list of UPI enabled banks and their UPI apps. You can also use independent UPI app BHIM developed by National Payments Corporation of India (NPCI) - and is recommended by RBI. Please insert the SIM of the mobile number which is registered to your bank before opening the BHIM app !! You can also access BHIM by just dialing the USSD *99# from your registered mobile number - without the need of any Data/Internet connection !! Please call +91-9163219023 or +91-9748394555 for more details and guidance on UPI. You can use the My Airtel app to make the payment. If you are a first time user you have to register your mobile number through OTP. You can use any mobile number to register with My Airtel app. Open the app, tap Payments Bank, Enter your mPIN. (If you are a first time user you may need to change the default mPIN sent to your registered mobile number). Enter the amount as mentioned in your Booking invoice, Select the payment option and then press Pay. Alternatively, you can tell us your 10 digit registered mobile number and we'll send the Booking invoice directly to your My Airtel account. (Your account should have sufficient balance for this to work). You will receive an OTP on your registered mobile number. All you have to do is just share the OTP with us !! If you already have any amount as your Airtel Wallet balance, you can use that to make payment as well. Upon successful payment a confirmation screen will be displayed on your mobile phone with the Transaction ID. You can use any mobile number to register with My Airtel app !! Please call +91-9163219023 or +91-9748394555 for more details and guidance on Airtel Payments. If you DO NOT have Paytm/ My Airtel app or any UPI app, you can make payment through Net Banking. If you have a Bank account with Net Banking (Internet Banking) facility activated, you can pay through NEFT/ EFT (Electronic Funds Transfer)/ IMPS (Immediate Payment Service) after login into your net-banking account. Please call +91-9163219023 or +91-9748394555 for more details and guidance on Online Electronic Fund Transfer. If you are not comfortable or quite conversant with Online Payment, we also provide options for Cash Payment. Please call +91-9163219023 or +91-9748394555 for more details and guidance on Cash Payment.